Please find workshops and events information below from Ku-ring-gai Council Youth Services. Come along to our Fitz Recording Studio and learn the art of studio recording and music/audio production processes. During this 4 week course you’ll use the latest hardware and software available in our dedicated studio facility. Bring an instrument or add your vocals to jam and create a track with the group from scratch! All levels welcome. Information and registration here. A dance party for young people aged 12 to 24 years with special needs. Information and registration here. Free music festival in North Sydney to celebrate National Youth Week. Shoreshocked is a drug and alcohol free all ages event held on the Lower North Shore of Sydney Australia. The event showcases some of the best Australia has to offer in Alternate, Indie Rock, Pop, and Reggae. For more information and booking click here. Meg Minkley from A Drawing A Day Productions will assist you in learning to explore and express your imagination, using a variety of mediums. From acrylic paints, to ink markers, pencils and posca pens, you will understand the magic behind these materials that can be used to empower your creative ideas and thinking’s. Information and registration here. Ku-ring-gai Youth Services invites you to head down to St Ives Skate park for a free community BBQ. Come meet our Youth Workers Emma and Maddie and find out more about what Youth Services has to offer. No bookings required. Krav Maga is a self-defence method developed and used by defence forces all over the world. It’s a fast and effective way to gain self-confidence, learn valuable lessons in self-defence as well as being a great work out. Information and registration here. Learn the skills to administer first aid in a variety of situations that you may face in everyday life/work places. Information and registration here. Enquiries contact Madeleine Perry, Youth Services Officer, Ku-ring-gai Council on 9424 0981 or 0419 294 362. St. Lucy’s School and Lifeline have collaborated to organise a community walk to help them shine a light on mental health issues and the need to talk and be heard. Read more. BMX is a fast and fun action sport with jumps and turns on a track which can be 300 to 400 metres in length. Read more. Presented by Oakhill College, the 46th Annual Art Exhibition, Art in the Hills, is on 24-26 March. Read more. 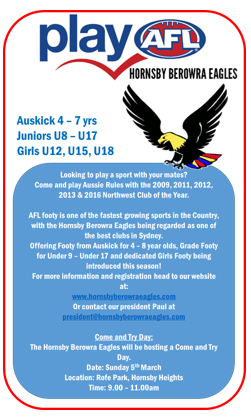 Hornsby Berowra Eagles Junior AFL Club have opportunities for boys and girls from 4 – 17 years across our Auskick, Grade and dedicated Girls Football formats. Read more.